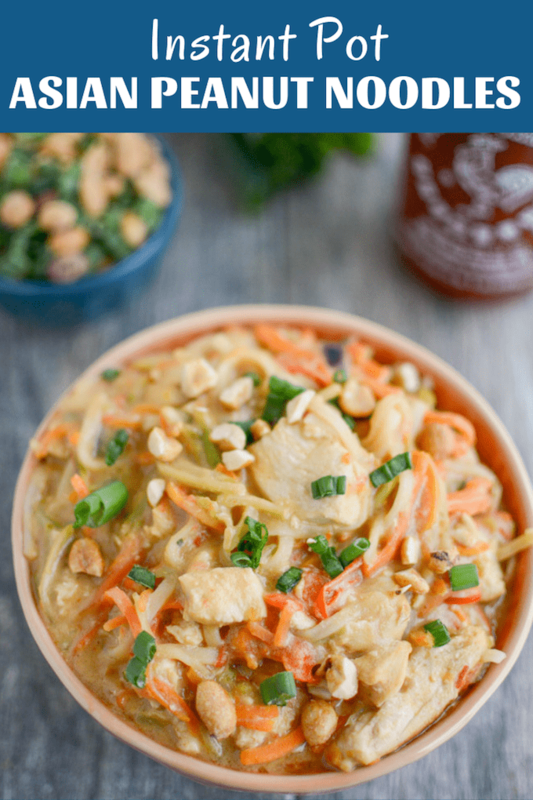 I’m so excited to share these Instant Pot Asian Peanut Noodles with you guys today! I’ve spent the last week or two back in the kitchen working on some new recipes and it feels good to be back! You guys know I love my Instant Pot and this recipe is no exception. It’s so quick and easy, perfect for throwing together on a busy night. (See stovetop directions below if you don’t have an Instant Pot.) I love how many veggies are packed in there and with a little sriracha at the end, you can give these a nice little kick! 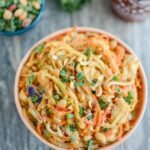 I’m newly obsessed with carrot noodles and have been grabbing one or two of the giant ones from the bulk section each week to spiralize. 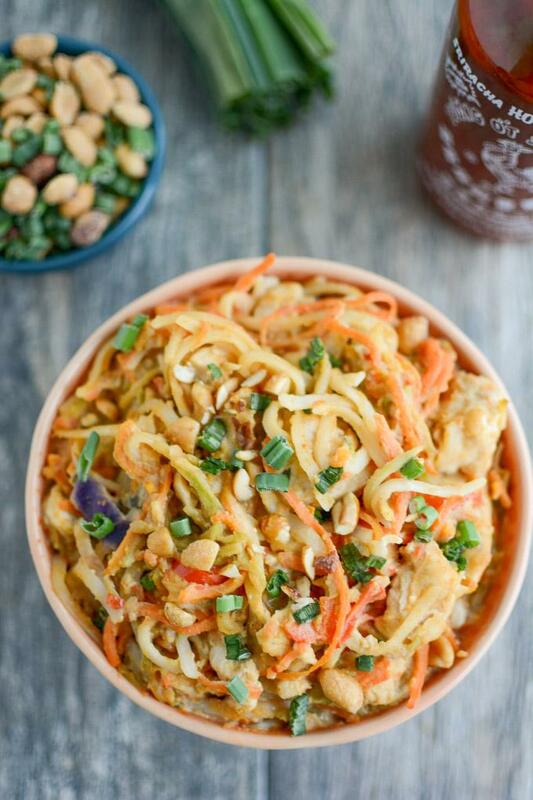 But if you can’t find any big enough to spiralize, you could try sweet potato or butternut squash noodles as well! These took two tries to get the liquid ratio right, but the second time was a charm. It’ll look pretty saucy right when you take the lid off, but the rice noodles will absorb the sauce a little bit as it sits and even more overnight. You only have to set the Instant Pot timer for 3 minutes so these cook quickly. Be sure to cut your chicken into bite-sized pieces so it will cook quickly. These also make great leftovers. You can enjoy them warm or cold depending on your preference. And if you don’t have an instant pot you can make them on the stove. Just cook the chicken and veggie noodles in a large pot. 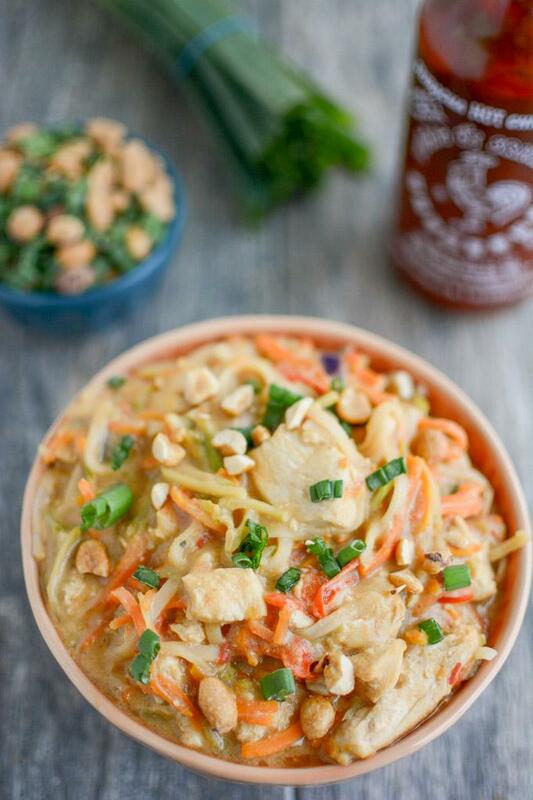 Cook the rice noodles in a separate pot and add them to the chicken mixture. In a bowl, mix together soy sauce, peanut butter, garlic, ginger, chili sauce and 1/2 cup -1 cup broth. Add sauce to chicken mixture and omit remaining broth. Be sure to let me know if you try them! First time trying the spiralizer, second using instant pot… it turned out ok! I could not figure out how to spiralize a carrot! I put everything in the pot, but it was really tough to stir and get things coated. My chicken burned a little at the bottom of the pot. Husband gave his seal of approval though! yeah you need to buy the jumbo bulk carrots in order to spiralize. Next time you could just chop into thin slices. Maybe next time try adding the sauce before the noodles to stir and then stir again! glad it was hubby approved.